Live streaming is becoming very popular these days and there are many applications for live video such as Google Hangouts on Air, Periscope, Balb.in and Meerkat etc. The social media users are live streaming every important event in their life and are sharing with their followers.The ways to Stream Live Video on a WordPress can be found here. Video live streaming is possible on WordPress site also, and few things need to be taken care of for this. There are three important parts in live streaming, and these are the pre-event, during the event and post-event. When there is an event coming up life, it needs to promote. Even before that decide on which platform or service the live streaming is coming up and what is the preparation needed for the live streaming. Promote the upcoming event on social websites. These will help increase the audience for the stream. During the event, introduce live chat to stay connected with the audience and to keep them engaged. Post-event, the main page can be edited and the broadcaster can thank the audience and can announce a new event. The live video can be published for replay. For basic live streaming, there is a requirement of one or more camera and a capture device. An internet connection or a hosting service and encoding software are also needed. 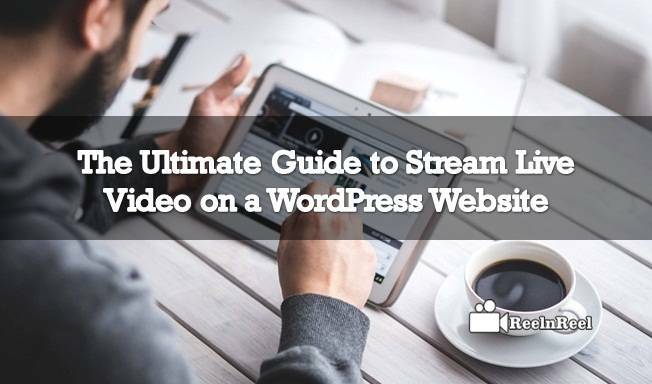 The live video can be embedded on WordPress site regardless of the streaming service. For this go to the hosting site of your video stream and find the embedded code. Select and copy it, in the Word Press page paste the copied embedding code by following the instructions. Default settings create no border for the live streaming, and these also do not allow scrolling. But these can be customised manually after embedding the code. Live streaming on WordPress site can be done using the Google Hangouts on Air. It can do via YouTube. This public video stream can use for questions and answer sessions, presentation and webinars. Articles, content and website links can share during the streaming, and the audience can open the links without interrupting the live streaming. Webcam live stream can also be added to the WordPress site and Video Whisper Live Streaming software helps you in this. The Live Stream tab button added to the group and the users can watch the live video and chat at the tab. Admins can use the live stream tab to go live at any time. However, this plug-in needs RTMP host to manage the live streaming. Win TVPro Plug-in is another that can be used to live stream from the webcam on WordPress site. NomadCast is another plug-in that can be installed on WordPress site. Word Press is the most popular webpage CMS and it is user-friendly. Live streaming on WordPress site is effortless. It is possible to connect the live video with other content that is already set up on the WordPress site. Word Press also allows some interesting features related to living streaming. The user can set up a countdown time plug-in available from WordPress. They can set a timer for the live streaming event and use this for pre-event promotion. WordPress also offers customized themes. The WordPress software also allows setting up a new page for the live video.